Following my Mokume Gane Experiments video I received many questions asking how I create my funky geometric jewelry pieces with a dark ‘border’ around each one. Instead of trying to explain, I recorded a video demonstrating the process from start to finish. I challenge YOU to run your own experiments. And be sure to tag @Magicbyleah when sharing on Instagram and Facebook. I Love your tutorials….. you have a pleasing voice, keep it simple yet share all we need to know…. some tutes are so boring I just mute and watch….. so thank you, for sharing your beautiful work and teaching us how…..I appreciate the simplicity !!!! Sending you hugs from Texas !! You always amaze me. I love the idea of the trim around the earrings & pendants, lovely. I really learned so much with this video, thank you. I would probably forget to flip the template…lolol, but after you telling us to not do that, maybe I will remember..lolol Thank you again. Leah, I love your tutorials. I am new to polymer clay and you have taught me so much and I love, love, love mokume gane. 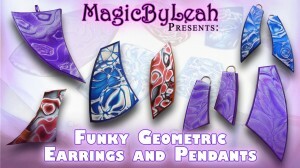 Can’t wait to try these geometric pieces….